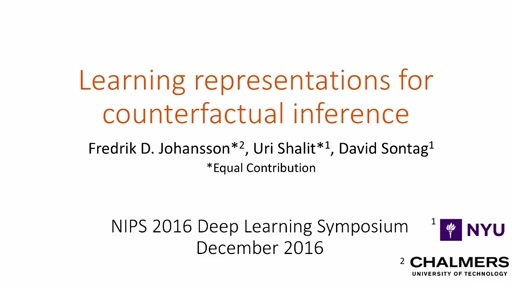 Deep Learning algorithms attempt to discover good representations, at multiple levels of abstraction. 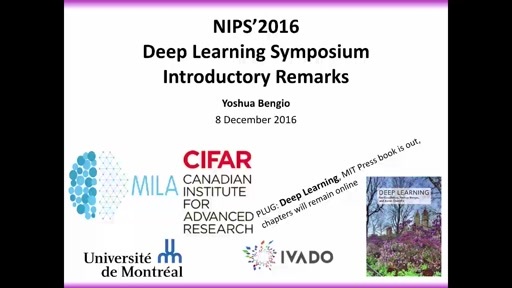 Deep Learning is a topic of broad interest, both to researchers who develop new algorithms and theories, as well as to the rapidly growing number of practitioners who apply these algorithms to a wider range of applications, from vision and speech processing, to natural language understanding, neuroscience, health, etc. Major conferences in these fields often dedicate several sessions to this topic, attesting the widespread interest of our community in this area of research. There has been very rapid and impressive progress in this area in recent years, in terms of both algorithms and applications, but many challenges remain. This symposium aims at bringing together researchers in Deep Learning and related areas to discuss the new advances, the challenges we face, and to brainstorm about new solutions and directions.